Revenue in the Milk & Cream segment amounts to US$262,155m in 2019. The market is expected to grow annually by 4.6% (CAGR 2019-2023). In global comparison, most revenue is generated in India (US$55,018m in 2019). In relation to total population figures, per person revenues of US$35.62 are generated in 2019. The average per capita consumption stands at 31.8 kg in 2019. Milk is an animal product containing proteins, lactose, fats and water. This combination of nutrients can also be milked from other animals such as sheep and goats, but cow's milk remains the world's most important dairy product in terms of economic importance. Along with Yogurt, Cream Cheese and Cheese, Milk is one of four segments in the Milk Products market. Reading Support Revenue in the Milk & Cream segment amounts to US$262,155m in 2019. Reading Support The Milk & Cream segment is expected to show a revenue growth of 6.3% in 2020. Reading Support The average revenue per person in the market for Milk & Cream amounts to US$35.62 in 2019. Reading Support In the market for Milk & Cream, volume is expected to amount to 253,329.2 mkg by 2023. 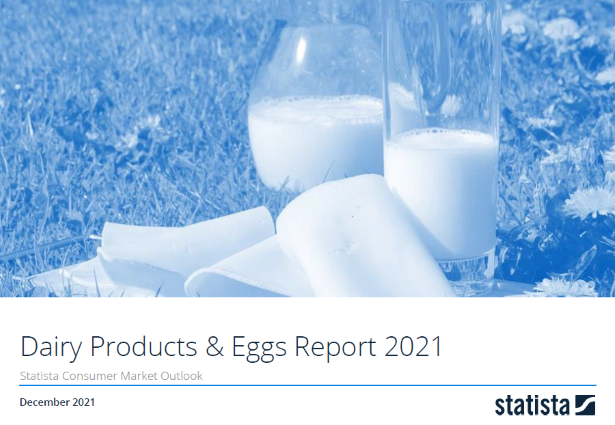 Reading Support The market for Milk & Cream is expected to show a volume growth of 2.8% in 2020. Reading Support The average volume per person in the market for Milk & Cream amounts to 31.8 kg in 2019. Reading Support The average price per unit in the market for Milk & Cream amounts to US$1.12 in 2019. Reading Support With a market volume of US$55,018m in 2019, most revenue is generated in India. Here you can find more studies and statistics about "Milk & Cream".